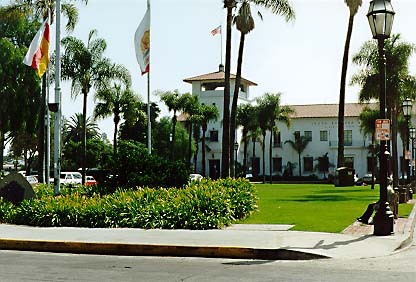 Near this site, August 26, 1850, two weeks before California statehood, duly elected common council, city of Santa Barbara, held first official meeting. Here in 1875, first city hall erected and area still center of city's governmental activities. Plaza scene early Santa Barbara fiestas and de la Guerra house set standards for Santa Barbara hospitality. 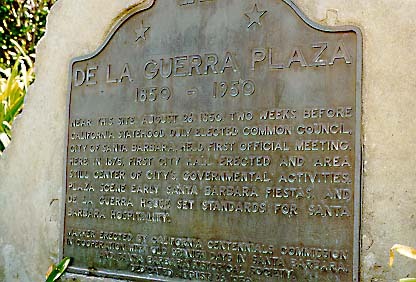 El Paseo Plaza, SE corner of De La Guerra St and De La Guerra Plaza, Santa Barbara. Return to other landmarks in Santa Barbara county.